Before I dive into the beautiful red strawberries, I was wondering if you have subscribed to my newsletter yet? We have lots of fun Summer projects going on at our house, and I will be sharing a huge affordable makeover soon. If you are interested, please sign up here: Subscribe to Redhead Can Decorate. This “Creamy Brown Sugared Strawberries” recipe is from my best friend’s grandfather years and years ago when I ate dinner at her house as a fourth grader. Her family brought it out to the dinner table after we ate, and I was terrified to try it. The grandpa convinced me to take a spoonful, and I’ll never forget how much I loved that very first bite. You see…it’s not what you think it is. The secret is the cream. You won’t believe it, but it’s not whipped cream, sweet cream, or even heavy cream. Any guesses? This is no joke and I definitely wouldn’t post this recipe At the Picket Fence if I didn’t think it was worthy. The reason it works, is that the brown sugar balances it all out. As a matter of fact, it reminds me of cheese cake when I eat it. Sweet, sour, sweet, sour. Sweet, sour. This is a must try. 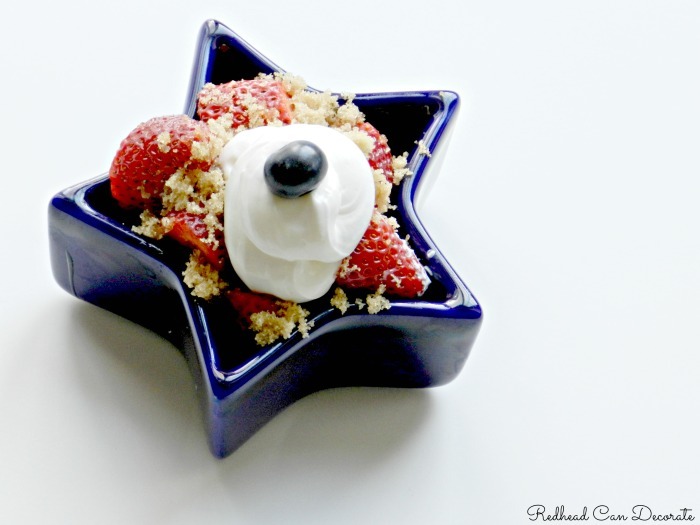 The recipe includes 3 simple ingredients…fresh strawberries, light brown sugar, and light sour cream. You won’t find a lot of measuring in this recipe because it’s not meant to be so precise. It’s meant to be Summer lazy, but still out of this world delicious. View Julie’s Detroit Home Magazine Photo Shoot HERE. 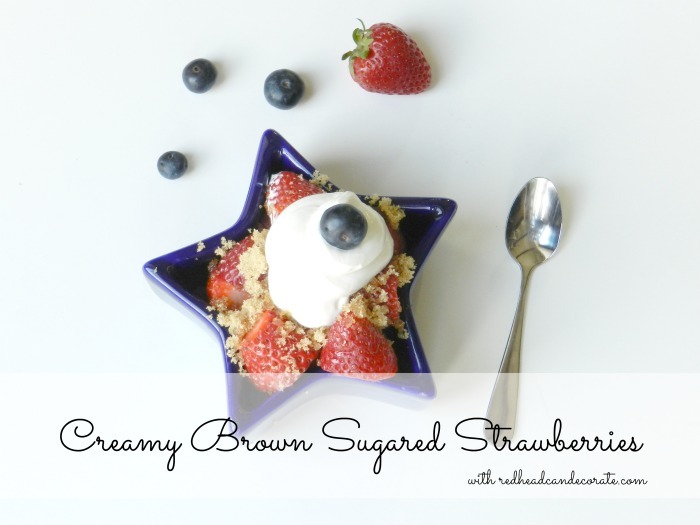 7 Comments on "Creamy Brown Sugared Strawberries"
Delicious! This was an ‘old timey’ dessert called Strawberries Devonshire. Thanks for the reminder- so easy and tastes amazing! Well isn’t that great to know, I’ll research it Jeanne! 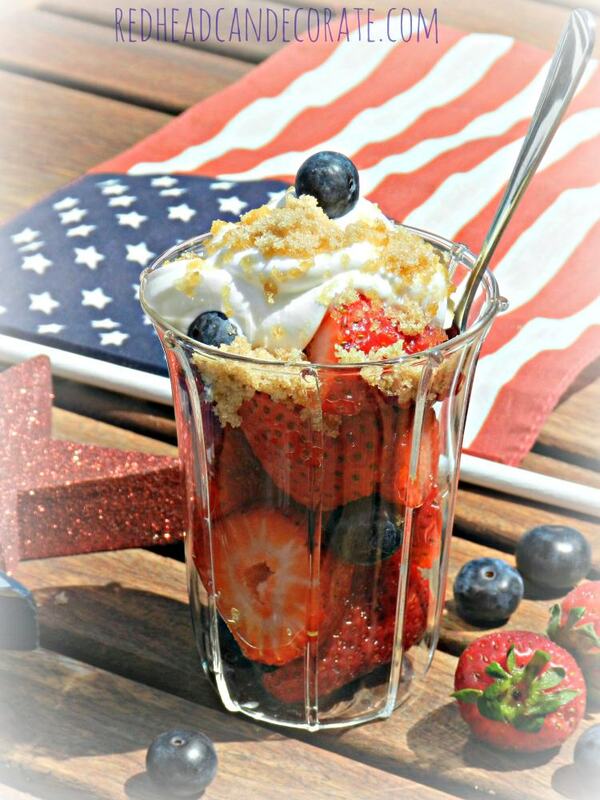 I MIX SOUR CREAM, BROWN SUGAR & A BIT OF VANILLA AND USE IT ON ALL FRESH FRUITS. RED GRAPES AND THIS SAUCE MAKES A GREAT SALAD/DESSERT. First of all, Vanessa, I love your new photograph. Secondly, this dessert is perfection. Anything with strawberries and tasting like cheesecake is a winner with me. I signed up for Julie’s newsletter.